Nobody’s travel tales are complete without stories of food. Whether good or bad, the lunch boxes in the airplane, freshness of the food available in different airports to fine dining in leading local restaurants of the place you visit – Food takes the center stage for a traveler. Picking on this insight and the general love for food worldwide, Turkish Airlines takes a light-hearted spin in their campaign #EpicFood featuring Chelsea vs Barca. So, what happens when the titans collide? Drogba, a leading football player from the ever-famous Chelsea explores his journey through multiple cities and is on a race to discover divergent cuisines from all over; finding Messi, the Barcelona football superstar wherever he goes! Turkish airlines, who boldly claims to fly to more countries in the world than any other airline, has brought two football legends in one advert – showcasing the fact that wherever you go, Turkish airline will always be there. The video captures all foodies and travel enthusiasts who are always on the go in exploring new food in their travel expeditions. #EpicFood, launched by Turkish Airlines is going full throttle on social media with people sharing their epic food experiences & pictures from different places in the world to stand a chance to visit all the places shown in the ad, sponsored by Turkish Airlines. Last year’s selfie shootout campaign by the airlines featuring Messi was very well received online, with the video becoming one of the top ad videos of the year on YouTube. 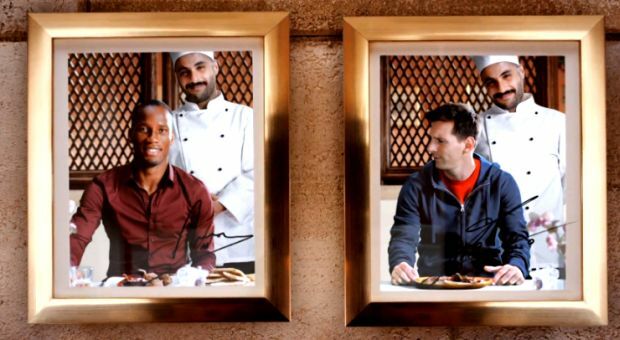 This year, Messi is back but with Drogba – Travelling around the world and experiencing various cuisine. The ad is only an indication of how fervent is Turkish Airlines about food. However, #EpicFood stands as just another spin in the wheel of their overarching idea, ‘Widen Your World’. Turkish Airlines aims to engage its users by asking them submit their entries that have surprised their taste buds during travels using the campaign hashtag. All submissions will be archived in an online ‘Epic Food Map’ that is viewable for everyone and will serve as an archive for future travelers to get inspiration from others travel experiences with food.